Drawing of a scientist. Credit: flickr.ghanima, Flickr.com. This Women’s History Month, the LSU College of Science is celebrating girls and women in STEM, from the bright youth who inspired us with their questions and excitement during our first Girls’ Night at the Museum event, to our three outstanding female LSU Rainmakers this year. This is the first year that all of LSU Rainmakers in STEM fields are women. 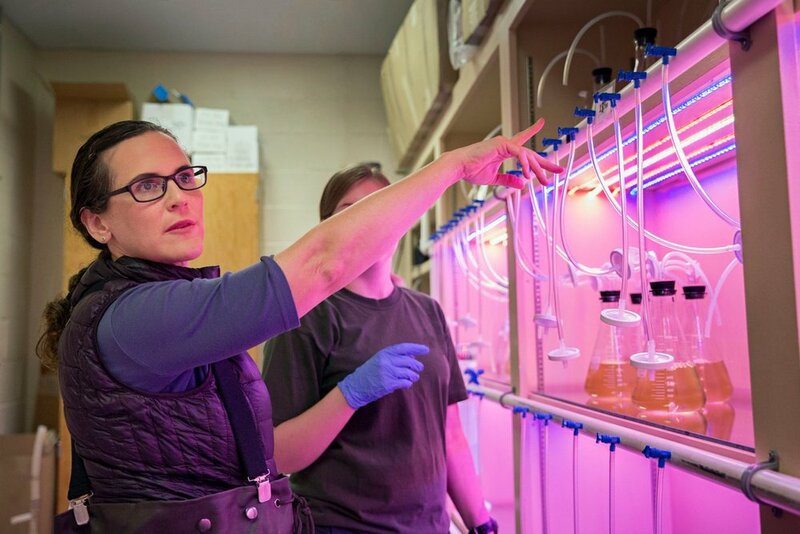 Morgan Kelly, an assistant professor in the LSU Department of Biological Sciences who studies stress responses in marine animals including oysters, won the Emerging Scholar Award. Karen Maruska, an assistant professor in the Department of Biological Sciences who studies the neural mechanisms of social behaviors, won the Mid Career Scholar Award. Ann Grove, Gregory Cannaday Burns Professor of Biological Sciences, won the Senior Scholar Award for her work on bacterial genomics and responses to stress. 2018 Rainmaker Awardees at The Club at Union Square. Photo credit: Cody Willhite, LSU. To complete our Women’s History Month coverage, we’ve interviewed two of our 2018 Rainmakers, Morgan Kelly and Karen Maruska, and Dean Cynthia Peterson, the first woman to lead the College of Science, about the changing perceptions and representation of women in science. A new meta-analysis published this month in the journal Child Development reveals that young girls today, when asked to draw a scientist, are drawing female scientists more often than they used to. This study shows that children's depictions of scientists have become more gender diverse over time, but that children still generally associate science with men, especially as they grow older. "These results may reflect that children observe more male than female scientists in their environments, even though women's representation in science has increased over time," study author David Miller and coauthors write. How can we continue to change gender stereotypes of scientists? We asked three women scientists at LSU to weigh in. LSU College of Science: Morgan and Karen, can you tell us a bit about yourself and some of your most exciting recent work or research findings? Morgan Kelly: My research group integrates fieldwork, experimental evolution and genetics to test for adaptation to environmental stress in marine invertebrates, with the goal of understanding how ecologically and economically important species will respond to a climate change. This week, my whole lab is in Corpus Christi, Texas at the Benthic Ecology meetings. My masters student Hollis Jones is presenting her work on the effects of heat and freshwater stress on oysters. One of the effects of climate change in this region will be an increased number of extreme rainfall events, especially in the summer months. This is bad news for oysters, because the fresh water (which is very stressful for them) will be coming at a time when they are already stressed by warm temperatures. Hollis has collected physiological and gene expression data to show that the two stressors together have a much bigger effect on oysters than you might predict based on the effect of either of the stressors in isolation. LSU biologist Morgan Kelly conducts research at an oyster hatchery in Grand Isle, LA. Photo Credit: Cody Willhite, LSU. Karen Maruska: I took a pretty traditional academic route before arriving at LSU in 2012, with school and research experiences that allowed me to live across the U.S. from New Hampshire to Florida to Hawaii to California. Now I have the kind of career I’ve always wanted, which includes running a research lab, teaching, and mentoring amazing students. In addition to doing science, I enjoy art and photography, sports, and just being outside. One research area my lab is currently studying is animal communication and how it may be influenced by their internal physiological or hormonal condition. Our broad question is, does sensory processing change with reproductive state of the animal so they are better able to detect quality mates? We use a very social African cichlid fish that communicates with visual, acoustic, chemosensory and mechanosensory (water movements) signals during courtship to address this question. We now have evidence that female vision and hearing are improved as they get ready to spawn, and an olfactory-processing region of the brain is more responsive to female odors in dominant reproductively active males than in subordinate non-reproductive males. This is exciting because we now have evidence for reproductive-state changes in sensory processing across different senses in both males and females. This type of sensory plasticity likely exists in many other animals, including humans. LSU College of Science: Morgan and Karen, what is the significance to you, of being a Rainmaker with one other amazing female scientist this year? Why do you think it's important for young scientists to have female role models or see women scientists honored in this way? Morgan Kelly: It’s a great honor, because Karen Maruska and Anne Grove are both role models to me – I’m proud to be in their company. Representation is important. We all need to be able to see ourselves in the leaders we admire. When I took my five-year-old daughter to the Wonder Woman movie, she leaned over and whispered, “Mommy, she looks just like me!” Ever since she saw that movie, she will tell you that she IS Wonder Woman, and that she “rescues people and animals from bad guys.” I firmly believe that the importance of role models is not limited to five year olds. We all need those moments of identification with someone we respect. Karen Maruska: I’m always in awe of some of the other amazing women scientists here at LSU, and especially in Biological Sciences, and I feel privileged and honored to be their colleague and share the Rainmaker award with them. I know the selection for the Rainmaker is very competitive, with so many great candidates, and it’s so awesome that the STEM recipients were all women this year – hopefully there will be many more times this happens in the future! I think having female role models is extremely important for young scientists, and seeing women receive praise and recognition via the Rainmaker award makes it more visible and shows that contributions by women are valued and appreciated. I think young women scientists can use it as inspiration to be the best than can be in their fields and move forward with the confidence that they can achieve great successes and be supported and acknowledged for their hard work. As a Rainmaker, I hope to be a positive role model for my own students and other young scientists at LSU and the scientific community as a whole. Karen Maruska in her lab. LSU College of Science: There's evidence from Draw-a-Scientist tests that girls today are more likely to draw scientists as women than they were 50 years ago. What things do you think have led to that change? How can we continue this trend? Morgan Kelly: I think that representation (or lack thereof) is a self-perpetuating cycle. We will have more female scientists when more little girls (and middle school students, high school students and college students) see themselves as scientists. In turn, they will be more likely to see themselves as scientists when there ARE more female scientists. That highlights the responsibility we have, as female scientists, to be visible. Karen Maruska: There are probably many things that have helped changed that trend, which is great! I would say that the increased visible presence of female scientists has helped tremendously. There are many more examples of prominent women scientists and leaders in movies, TV shows, books, on social media, etc. now than when I was young. Promoting women in science is now more of a focus in the community, and highlighting the achievements of women scientists online and in the news makes the profession more accessible and relatable to young women. More women scientists at universities doing outreach activities also now allows young students to interact with real women scientists and have them as role models. To continue this trend, I think we all have to do our part to provide a supportive environment for women to feel confident and valued in STEM fields, with equality and respect. I think myths about the right “types” of people who can be scientists are quickly fading, and I saw that with my own eyes with these Girl Scouts. We have many outstanding role models today in science. Very famous women, from Marie Curie, to Rosalind Franklin, to LSU’s own Gabriela Gonzalez, have been pioneers in science throughout history. We professional scientists recognize how important it is to reach students early so that they see all types of people “doing science,” and see how fun, engaging, challenging and socially fulfilling a career in science can be. We are increasingly mindful to engage students early and often so that we can keep them fascinated with science, and so that they can see themselves in similar roles. I am a firm believer in the importance of communicating the fun and wonder of science to the general public, along with the great benefits science brings to humans of all kinds in all places. We have to keep this up! LSU College of Science: What do you think still needs to be done, to improve gender equality in science, recruit and retain women in STEM, and break down barriers and stereotypes? Morgan Kelly: I think we need to be really good mentors to younger women. This means being vigilant about the obstacles they face, and tireless advocates for the things they need to be successful. Access to high quality and affordable childcare is still a huge barrier, because the responsibility for coordinating childcare still falls disproportionately to women. We also need to teach young women to recognize sexism where it exists, because when they can recognize and name it, they will be less likely to internalize its messages. Karen Maruska: I think retaining women in STEM is our biggest challenge right now, and there are several reasons we’re losing intelligent and inspiring women in science. While I think we’ve identified many of these factors, but coming up with the correct solutions and then implementing them needs to be a societal effort. Having the necessary resources to do this has to be supported by universities at the top administrative level and then needs to trickle down to each individual working at the institution. Open communication about these issues is also important so that more people are educated about gender equality and feel invested in doing what they can to improve it. The recent diversity and inclusion movement in faculty hiring, conference speakers, and funding opportunities is a step in the positive direction. Dean Peterson: We need to emphasize the team-based, collaborative aspect of science. When the whole is more that simply the sum of the parts, there is synergy and individuals feel valued and motivated. We also need to make sure that we are looking ahead rather than looking back. Although science has been a male-dominated field, that is no longer true. So we need to make sure that we are being inclusive. It makes science better! LSU College of Science: What is the LSU College of Science doing to promote gender equality and representation in STEM? Dean Peterson: Hiring more women faculty is a priority for the LSU College of Science. We have recently added women faculty in all departments, including Mathematics and Physics & Astronomy. These are disciplines where women remain underrepresented across the country. We are targeting scholarships for this purpose, and seeking out the best and brightest females and encouraging them to come to LSU as faculty and students. We are also gathering data, not just about how many females we have as students, faculty and science staff, but also about how individuals’ work experiences vary here at the university. We are actively discussing these issues and working to remedy them. One example is that we have applied for an National Science Foundation (NSF) grant to tackle gender equality across the university, beginning with STEM disciplines. We are also focusing on collaboration. We want to provide robust opportunities for success and collaborative research projects for everyone! Great advances in science often involve collaboration across disciplines. We worked all fall in this area, with weekly meetings that involved women and men faculty from science, engineering, coastal studies, humanities and social sciences, and agriculture. We read the most recent social science studies that deal with gender issues across universities and set our strategies to make sure that LSU is a great workplace for all. LSU College of Science: Have female role models been important in your own career? Who has been your role model? What kind of role models do you think are most inspiring or helpful? Morgan Kelly: My postdoctoral mentor Gretchen Hofmann at UCSB was a really important mentor to me in the way she modeled both self-confidence and confidence in the abilities of her team – it was incredibly contagious. Some of the most important role models for me have been women who helped me see myself and my challenges in a new way. The first time I met Dean Peterson, I mentioned that I had young children, and that I was feeling like a bad mom that day because my stress over an NSF deadline had caused me to forget “snack day” at my daughter’s preschool. She smiled, and said, “Wow, it sounds like your life is really full!” I often go back to that re-frame, and repeat it to myself when I feel over-extended. Karen Maruska: I’ve been fortunate to have many amazing mentors and role models along the way. While I did have positive female role models, I was more gender-blind when it came to mentors and role models than many others. To me, it didn’t matter much whether they were male or female, but just that they had inspiring qualities, challenged me to expand my horizons, and provided an encouraging environment for me to pursue my passions. I think this illustrates an important point. Men can be equally effective role models for women in science, and we need their support to continue the positive trend towards equality. The most helpful role models and mentors to me were those who shared their philosophies or reasoning for their decisions and actions – knowing why and how they make the choices they do in both their day-to-day lives for bigger career-related decisions gave me important skills for navigating my own life and career. Role models who are successful, happy and strong, and who strive to do the right thing but at the same time are willing to admit their mistakes and learn from them, are always most inspiring to me. Dean Peterson: I had two female role models during my development as a brand new faculty member. Both were tenured faculty members in my department. They supported me and encouraged me to take on new challenges over the years, like chairing my department, going for large collaborative grants with NIH and NSF, and embracing opportunities to mentor other women who were just entering science. They helped me realize that I can be an encouraging role model for others, and they helped me believe in myself. Through lots of discussions with these mentors, I embraced the Nike Philosophy: “Just do it!” And I am glad I did! These two women are Mary Ann Handel, who is now a senior investigator at the Jackson Laboratory in Bar Harbor, Maine (the best grant writer I know), and Liz Howell, who is a professor at the University of Tennessee (who is the quintessential scientist who still works at the lab bench most days). LSU College of Science: What does gender equality in STEM mean to you? How does diversity make science better, or help us reach better discoveries? Dean Peterson: Gender equality means providing the same opportunities for everyone. It involves reaching beyond the university to elementary and middle schools to make sure that we prepare curious and talented minds ready to ask big questions. The best science comes from many voices asking many questions and “pushing the boundaries” — challenging each other to test new ideas and embrace different approaches. We must have the ability to listen to others, respect them, and take their ideas seriously. This is harder than it sounds, but that is my ideal. Morgan Kelly: Barriers to access in science create mental drag. When a woman or a person of color spends time worrying about whether she / he is welcome, and whether everyone else is wondering why she / he is there, that is mental energy spent on something other than science. It is only when barriers to access are removed that we can unleash all of the brain power that is available to science. Karen Maruska: Gender equality to me just means that everyone, regardless of gender identity, should have the same opportunities and be treated with the same respect. Diversity is extremely important in science. One of the most important drivers of scientific discovery is differences in ideas and hypotheses to explain the same concept. This leads to experimental testing, interpretation, generation of new hypotheses, and ultimately making discoveries to move the field forward. By bringing together people from different backgrounds, cultures, genders, etc., we also bring diversity into scientific ideas, approaches to test them, and in their interpretation. I think we can all see how diversity leads to important advancements in many aspects of our society, and I believe that working to achieve better diversity in science will lead not only to groundbreaking scientific discoveries, but also improvements in education and more productive and inclusive workplace environments. Sign up with your email address to receive updates from the LSU College of Science Blog.